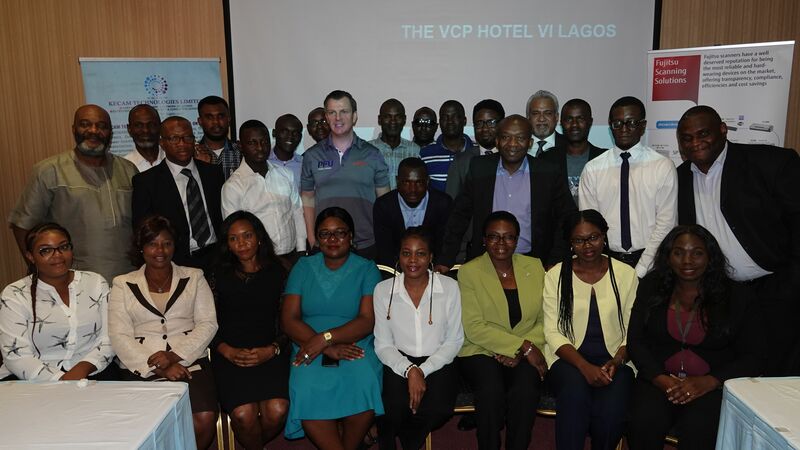 Kecam Technologies Limited, an information technology organization and authorized Fujitsu scanner sales and services partner for Nigeria participated in an industry event to set the agenda for data protection compliance and digital transformation of organizations across Nigeria. Organizations are beginning to take document digitization to the next level due to increasing demand for compliance as well as document and data protection. Kecam Technologies Limited in conjunction with Fujitsu participated in the event during January 2019 for end-users across banking, insurance, finance, education, transportation and shipping, government, legal, oil & gas, and manufacturing amongst others. Attendees in group photo at the Fujitsu Forum held on Wednesday, January 15, 2019 by Kecam Technologies in Lagos. The event showcased various Fujitsu Document Imaging Solutions from the entry-level scanners to high-end high-speed enterprise scanners based on cutting-edge technologies and ease of use and maintenance. According to Bonny Mekwunye, Vice Chairman of Kecam Technologies Limited, “Fujitsu Document Imaging Solutions cannot be compared with the competition because of their ruggedness, ease of use as well as extremely-low total cost of maintenance and award winning capture software”. Furthermore, Mr Mekwunye maintained that with the increasing demand for compliance as well as document and data protection, organizations are beginning to take document digitization serious and to the next level. According to Mr Mekwunye, “using the right equipment and software needed to protect your valuable information cannot be take for granted. Fujitsu Document Imaging Scanners, both standalone and network scanners, are primed to deliver superior productivity, low cost of ownership bundled with Fujitsu Paperstream software that will make your digital transformation easy and effortless”. Equally, the Fujitsu PaperStream Capture Pro – a powerful capture process software helps organizations of all sizes to increase efficiency of their document scanning processes, flexibly transforms documents from many sources into valuable business data, and provides powerful and intuitive user experience and automated data extraction that minimizes administration. For organizations that depend on paper-based processes, PaperStream Capture Pro is the scanning, extracting and releasing software that enables you to digitize your paper-based data in order to optimize your information flow and knowledge sharing. With PaperStream Capture Pro, you can: • Improve workflows, • Increase efficiency, • Achieve easier compliance, • Gain better visibility, • Perform with greater agility, and • Enhance customer experiences. In combination with the fi Series document scanners it enables organizations to quickly convert paper-based data into valuable business information. PaperStream Capture Pro helps organizations ranging from small and medium-sized businesses to large enterprises and public services to minimize effort and complexity and boost the business efficiency of document capture processes. The event included practical demonstration of the PFU broad portfolio of document scanners for professional personal, desktop, workgroup, high-volume production and networked environments in addition to Paperstream and Scansnap Manager. Mr Bonny Mekwunye, Vice Chairman, Kecam Technologies (left); Adrian Cafferkey, Regional Manager PFUE (EMEA) Limited, a Fujtisu company and Mr Anil Punjab, GM, Astel UK at the Fujitsu Forum event in Lagos. Mr Cafferkey further stated that “Worldwide shipments of Fujitsu branded scanners has surpassed 10 million units. Since 1983, Fujitsu branded scanners have been designed, manufactured and marketed by PFU Limited, a wholly owned subsidiary of Fujitsu. PFU has continuously focused on its customers’ needs, offering a broad portfolio of document scanners for professional personal, desktop, workgroup, high-volume production and networked environments and is the world’s leading document scanner company”. Adrian Cafferkey continued that “PFU Limited is excited to work with Kecam Technologies Limited in supporting their various customers in Nigeria because of their strong technical expertise in the installation, maintenance and repairs of all ranges of Fujitsu Scanners”. Mr Cafferkey describes Nigeria as “a very important market for us and we hope to leverage further success and growth by taking advantage of the considerable skill sets of Kecam Technology, its substantial expertise, knowledge and impressive client base to extend the reach of our best in class products, solutions and service offerings”.